Sometimes you just need something easy that can be whipped up quickly and doesn't create a lot of dishes. Our Spring Break was that way-a bit on the lazy side but at the same time, we craved something more than cereal for dinner. I've made this a few times and we have really enjoyed the Earthy, buttery mushrooms, salty bacon, and fresh herbs. When spooned over thick pieces of good bread, it's a really satisfying snack, lunch, or even dinner. 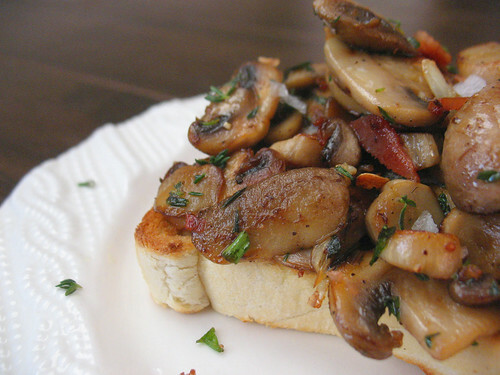 Mushrooms on toast seems almost overly simple but believe it or not, it's surprisingly satisfying. I like to add bacon, slivers of garlic, fresh cracked pepper, a bit of lemon zest and some fresh chopped thyme. You can leave out the bacon if you want this to be vegetarian, but I like to add it in. Mushrooms tend to have a lot of water in them. The trick to sear and brown them so they get a nice crust rather than just boil in the juices is to use high heat initially and not stir them too much. The mushrooms will release their liquid, it will boil off, and then the mushrooms will brown up nicely. The reason I have you use oil and butter together is the butter adds some great flavour, but it tends to burn so the olive oil will keep that from happening. Mushrooms are usually pretty dirty. You don't want to rinse them off under running water, as they would absord the moisture. Instead, wipe them off well with a damp paper towel. You'll be surprised how much stuff comes off of them, even when they look mostly clean! In a large fry pan, melt the butter with the olive oil in the pan over medium heat. Add the sliced mushrooms and toss them in the butter and oil to coat. Without stirring them too much, let them bubble and cook; releasing their liquid, and then when it boils off letting them brown in the pan. Once they are browned, add the garlic, cooked bacon and green onion. Toast the bread. You don't really need to butter it because there's enough juice and butter in the mushrooms. Sprinkle the thyme, pepper, and lemon zest to taste over the mushrooms and toss. Mound the mushrooms on the toast and serve.